Zelda gamers these days are often talking about an overall “decline” in the series, or how it is gradually becoming easier over time. The olden difficulty of the originals, or even the Nintendo 64 era, is said to be way beyond the modern releases. For years, it has been established that Zelda isn’t as hard as it used to be, but hardness isn’t everything. Length, duration and simply overall size play just as an important role as difficulty. These characteristics can also be seen as deteriorating as The Legend of Zelda series gets older. When I first experienced Twilight Princess, I was promised a solid 60+ hours of gaming in one of the largest worlds gaming has seen, and definitely the largest in Zelda. No doubt the promise of a big world was delivered, but what was the point of it being so big with so little? A game could be great if it only took place in one house, so long as the detail was there. The Hyrule Fields were massive, yes, but they didn’t really need to be. They created some feelings of grandeur to see Hyrule have become so large, but served no purpose. And as for the time, well Twilight Princess took me just over 30 hours on the first playthrough, and 40 hours, or so, the second time around where I completed majority of the sidequests. These days though, to just finish the story, it only takes about 14 hours. When I am told that a game has 60+ hours to it, I like to think that means the main quest will take you that long to complete, not absolutely everything. It’s an artificial way to make a game longer by cramming it with sidequests, as opposed to extending the actual core story. Dragon Quest IX, released this year, was a game that was said to have over 100 hours of gameplay. Now the story itself took me over 70, incorporating a large amount of potentially unnecessary leveling up I did, but nevertheless, that’s how long it took me to complete it. Had I then embarked on all of the quests, it would have cleared 100 hours easily. Now that was a game that provided length. In recent times, Zelda hasn’t necessarily provided the lengthy quests that it has promised. The games can feel a bit emptier than they used to. The length, in many regards, is artificial. It is an additional sidequest, that often seems out of place. It is collecting rabbits in Spirit Tracks, or poes and bugs in Twilight Princess. Yes, they enhance length, but not necessarily in the preferred way. A key thing to any new Zelda game that comes out are sidequests that don’t feel like mere additions for that sole purpose of extending the amount there is to do in the game. Quality over quantity right? Gamers will also talk about how it takes smaller amounts of time to complete dungeons these days, and how there’s less to do between dungeons, which can be true, but isn’t always. Interestingly look at the number of dungeons in recent games: The Wind Waker has seven, Twilight Princess has 10 (be that one is optional), Phantom Hourglass has eight and Spirit Tracks has six. Now look at Ocarina of Time, which has 11 or 12 depending on how you look at it, and Majora’s Mask, which has four main temples, four mini-dungeons and two optional spider houses. Can we really judge game length by number of dungeons though, considering how size varies? We’re all aware that Majora’s Mask is a game of quality over quantity. Notable, is how Majora’s Mask’s sidequests are so relevant to the game, that to many people, they are the game. As I write this, I can’t help but disagree with this whole notion anyway. Overall, I don’t truly think Zelda is getting much shorter. Admittedly, there are some poor attempts at length through sidequests, and some storylines that drive the reasoning behind some dungeons are kind of silly. Back in the Ocarina of Time days, we were given the task, and had to find the five temples. In Majora’s Mask, there was always four. These days we collect three tears of light, completer another dungeon and then learn that the mirror is shattered so go through another three. Perhaps it is because in the olden days we were given the whole game as a task at once, not in little increments, which makes them seem longer. Zelda will never be able to be unlimited in length, like Pokémon manages, although improvements can definitely be made. It is not necessarily fair to say that overall game size is deteriorating. Length and hardness go hand in hand. Is it that modern games are quicker because we are now used to the Zelda formula? I mean Ocarina of Time took me 100s of hours the first time, but now only takes eight. Majora’s Mask was 100s but is now only 12. Is it difficulty that gives the illusion of length? Because, now that I am experienced at both Twilight Princess and Ocarina, I can tell you that a speed run of both games leaves Twilight Princess as six hours longer. Has length really been deteriorating? Are people forgetting that the length of handhelds can’t really compare to the length of console titles, so say that the two recent Zeldas have been getting smaller? 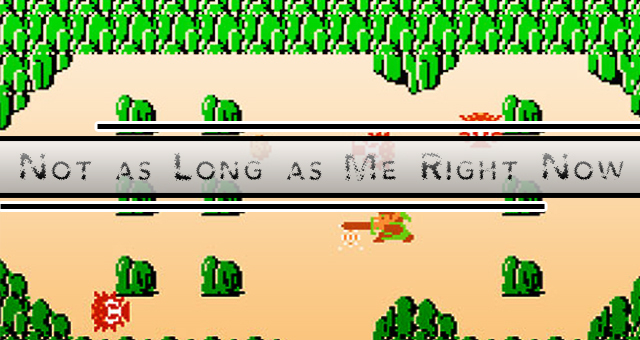 To me, Zelda’s problem isn’t number of dungeons, or even main story length. It is the lack of sidequests that feel like they belong in the game like Ocarina of Time’s Golden Skulltulas did. It is also the poor excuses that drive the reasoning behind the need for these dungeons. Zelda may remain just as long as it has always been, but due to the experience of players and other facts, it is now finding it hard to be sustainable in both duration and quality. It should work on being stronger for longer, but not artificially, rather, through the main quest itself, not the messing around that comes after the core experience is over.